This page provides supplementary data to the article properties of water. Further comprehensive authoritative data can be found at the NIST Webbook page on thermophysical properties of fluids. Except where noted otherwise, data relate to standard ambient temperature and pressure. where P is equilibrium vapor pressure in kPa, and T is temperature in kelvins. For T = 273 K to 333 K: A = 7.2326; B = 1750.286; C = 38.1. For T = 333 K to 423 K: A = 7.0917; B = 1668.21; C = 45.1. Data in the table above is given for water–steam equilibria at various temperatures over the entire temperature range at which liquid water can exist. Pressure of the equilibrium is given in the second column in kPa. The third column is the heat content of each gram of the liquid phase relative to water at 0 °C. The fourth column is the heat of vaporization of each gram of liquid that changes to vapor. The fifth column is the work PΔV done by each gram of liquid that changes to vapor. The sixth column is the density of the vapor. 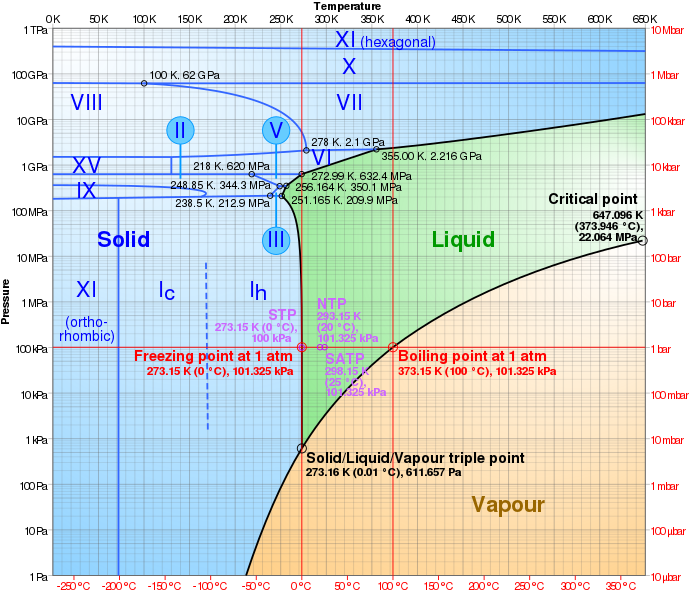 Log-lin pressure–temperature phase diagram of water. The Roman numerals indicate various ice phases. Note: ρ is density, n is refractive index at 589 nm,[clarification needed] and η is viscosity, all at 20 °C; Teq is the equilibrium temperature between two phases: ice/liquid solution for Teq < 0–0.1 °C and NaCl/liquid solution for Teq above 0.1 °C. The data that follows was copied and translated from the German language Wikipedia version of this page (which has moved to here). It provides supplementary physical, thermodynamic, and vapor pressure data, some of which is redundant with data in the tables above, and some of which is additional. In the following table, material data are given for standard pressure of 0.1 MPa (equivalent to 1 bar). Up to 99.63 °C (the boiling point of water at 0.1 MPa), at this pressure water exists as a liquid. Above that, it exists as water vapor. Note that the boiling point of 100.0 °C is at a pressure of 0.101325 MPa (1 atm), which is the average atmospheric pressure. ‡ The values for surface tension for the liquid section of the table are for a liquid/air interface. Values for the gas section of the table are for a liquid/saturated steam interface. In the following table, material data are given with a pressure of 611.7 Pa (equivalent to 0.006117 bar). Up to a temperature of 0.01 °C, the triple point of water, water normally exists as ice, except for supercooled water, for which one data point is tabulated here. At the triple point, ice can exist together with both liquid water and vapor. At higher temperatures, the data are for water vapor only. The following table is based on different, complementary sources and approximation formulas, whose values are of various quality and accuracy. The values in the temperature range of −100 °C to 100 °C were inferred from D. Sunday (1982) and are quite uniform and exact. The values in the temperature range of the boiling point of water up to the critical point (100 °C to 374 °C) are drawn from different sources and are substantially less accurate; hence they should be used only as approximate values. The values apply only to smooth interfaces and in the absence other gases or gas mixtures such as air. Hence they apply only to pure phases and need a correction factor for systems in which air is present. The values were not computed according formulas widely used in the US, but using somewhat more exact formulas (see below), which can also be used to compute further values in the appropriate temperature ranges. The saturated vapor pressure over water in the temperature range of −100 °C to −50 °C is only extrapolated [Translator's note: Supercooled liquid water is not known to exist below −42 °C]. The values have various units (Pa, hPa or bar), which must be considered when reading them. The table values for −100 °C to 100 °C were computed by the following formulas, where T is in kelvins and vapor pressures, Pw and Pi, are in pascals. Accepted standardized value of the magnetic susceptibility of water at 20 °C (room temperature) is −12.97 cm3/mol. Accepted standardized value of the magnetic susceptibility of water at 20 °C (room temperature) is −0.702 cm3/g. ^ Lide, David R. (2004). CRC Handbook of Chemistry and Physics (85 ed.). CRC Press. pp. 6–15. ISBN 0-8493-0485-7. ^ Maksyutenko, Pavlo; Rizzo, Thomas R.; Boyarkin, Oleg V. (2006). "A direct measurement of the dissociation energy of water". The Journal of Chemical Physics. 125 (18): 181101. Bibcode:2006JChPh.125r1101M. doi:10.1063/1.2387163. PMID 17115729. ^ Cook, R; Delucia, F; Helminger, P (1974). "Molecular force field and structure of water: Recent microwave results". Journal of Molecular Spectroscopy. 53: 62. Bibcode:1974JMoSp..53...62C. doi:10.1016/0022-2852(74)90261-6. ^ Hoy, AR; Bunker, PR (1979). "A precise solution of the rotation bending Schrödinger equation for a triatomic molecule with application to the water molecule". Journal of Molecular Spectroscopy. 74: 1–8. Bibcode:1979JMoSp..74....1H. doi:10.1016/0022-2852(79)90019-5. ^ "List of experimental bond angles of type aHOH". Computational Chemistry Comparison and Benchmark DataBase. ^ "Water and the Speed of Sound". www.engineeringtoolbox.com. Retrieved 2008-04-29. ^ Lange, p. 1199. Due to the old definition of liter used at the time, the data from the Handbook was converted from old g/ml to g/cm3, by multiplying by 0.999973. ^ Franks, Water a comprehensive treatise Volume 1 The Physics and Physical Chemistry of Water. ^ David R. Lide CRC Handbook of Chemistry and Physics CRC Press, 2004, p. 6-201 ISBN 0-8493-0485-7. ^ Revised Release on Viscosity and Thermal Conductivity of Heavy Water Substance, The International Association for the Properties of Water and Steam Lucerne, Switzerland, August 2007. ^ Martin Chaplin. "Water Phase Diagram". London South Bank University. Retrieved 2008-01-21. ^ Lide, D. R., ed. (2005). CRC Handbook of Chemistry and Physics (86th ed.). Boca Raton (FL): CRC Press. pp. 8–71, 8–116. ISBN 0-8493-0486-5. ^ Martin Chaplin. "Ionization of water". London South Bank University. Retrieved 2008-04-09. ^ Martin Chaplin. "Water Absorption Spectrum". London South Bank University. Retrieved 2008-04-10. H NMR PFG measurements". Physical Chemistry Chemical Physics. 2 (20): 4740–4742. Bibcode:2000PCCP....2.4740H. doi:10.1039/b005319h. ISSN 1463-9084. ^ Guildner, L. A.; Johnson, D. P.; Jones, F. E. (1976). "Vapor Pressure of Water at Its Triple Point: Highly Accurate Value". Science. 191 (4233): 1261. Bibcode:1976Sci...191.1261G. doi:10.1126/science.191.4233.1261. PMID 17737716. ^ a b c Weast, Robert (1983–1984). CRC, Handbook of Chemistry and Physics 64th edition. Boca Raton, Florida: CRC publishing. pp. E-119. ISBN 0-8493-0464-4. Compilation of properties, with citations by Martin Chaplin, London South Bank University.